Medical (MBBS) course under the Directorate General of Health Service (DGHS) admission 2017 will be published soon. 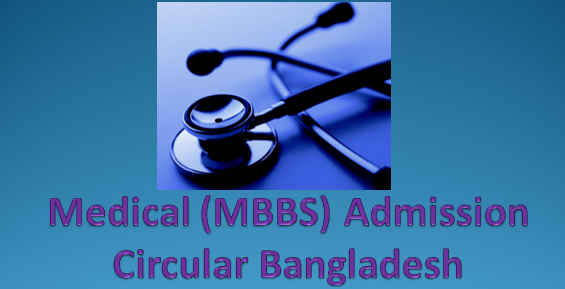 After published the HSC result the MBBS admission notice will be published. Medical admission test notice for 2017-18 is available on our website. It is also getting from the website www.dghs.teletalk.com.bd. Both Public and Private Medical and Dental College Admission Test circular is announced after publishing the HSC result. HSC result is published on 23 July 2017. MBBS Medical Admission Test will be held on 6 October 2017 and Dental Admission Test will be held on 30 November 2017. Students who passed HSC examination with the science background only they can apply. Who passed their SSC or similar exam in 2014 or 2015 and complete their HSC or similar exam in 2016 or 2017 only they can apply. Applicants must get total GPA 9.00 in SSC and HSC exam. Biology will in HSC or equivalent exam and GPA 3.50 is compulsory for Biology. MBBS Medical Admission Test Result 2017-18 will publish soon. You can check your admission test from our website and also from MBBS official website www.dghs.gov.bd in this website. When the result officially published then you can check your MBBS admission test result 2017-18 from online. So, Stay with us. You can Now avilable to check your MBBS Admission test result 2017-18 from online. just follows us. There are twenty-nine (29) Public Medical College in Bangladesh. In Public Medical College there are 3162 seats are available. In Bangladesh, 5325 seats are available in Sixty four (64) Private Medical College. There are nine (09) Public Dental College in Bangladesh and they have 532 seats for the students. Twenty-four (24) Private Dental College has 1280 seats. You can download here Bangladesh all medical Admission test result 2017-18. So stay with us. For more educational information update news and important news please stay with us. Thanks again for visiting us.